The Eclipse Cross has been dubbed a coupe by the automaker. Mitsubishi will kick off its long-promised product revival with a new compact crossover dubbed the Eclipse Cross, slated to hit the Canadian and U.S. markets in 2018. "I am pleased to confirm the Eclipse Cross will join the Canadian lineup," Mitsubishi Canada spokesman John Arnone said. More details about the Canadian arrival will be revealed during the 2017 Geneva International Motor Show, which runs March 9-19. The all-new crossover will slot between Mitsubishi’s current Outlander Sport and its larger Outlander. At 4.39 metres (173 inches) long, the Eclipse Cross -- dubbed a coupe by the automaker -- is 17.75 cm (seven inches) shorter than a Honda CR-V and 12.7 cm (five inches) shorter than a Ford Escape, though the wheelbase of all three is within 2.5 cm (an inch). The crossover was revealed Tuesday ahead of next week’s official debut at the Geneva auto show. It will go on sale in Europe later this year. Globally it will come with two powertrain choices. Foreign markets will receive a 2.2-litre four-cylinder turbodiesel matched with an eight-speed automatic transmission. The U.S. market will get only the gas engine: a 1.5-litre direct-injection turbocharged four-cylinder paired with a CVT gearbox that features a sport mode with eight simulated gear changes. The Eclipse Cross will come with front-wheel drive as standard while an electronically controlled four-wheel-drive system and brake-activated torque vectoring will be optional. The vehicle’s styling is a more pronounced take on current Mitsubishi cues. The front is full of sharp angles and the brand’s two-bar “dynamic shield” grille design; squint and it bears a resemblance to a Lexus RX crossover. The silhouette is marked by an aggressive slant to the rear hatch, cutting into cargo room and giving it the “coupe” look Mitsubishi ascribes to it. The rear end is highlighted by a sharp LED light bar running horizontally between the two rear glass windows. Inside the Eclipse Cross seats five. A new touchpad sits in the center console and controls the infotainment screen mounted on the dashboard. A new head-up display will be available, as will features such as heated leather seats, a heated steering wheel, radar cruise control, forward collision warning and lane-departure warning. Pricing on the new model hasn’t been announced but it’s expected to start in the low to mid-$20,000 range in the United States. No pricing for Canada has been announced. 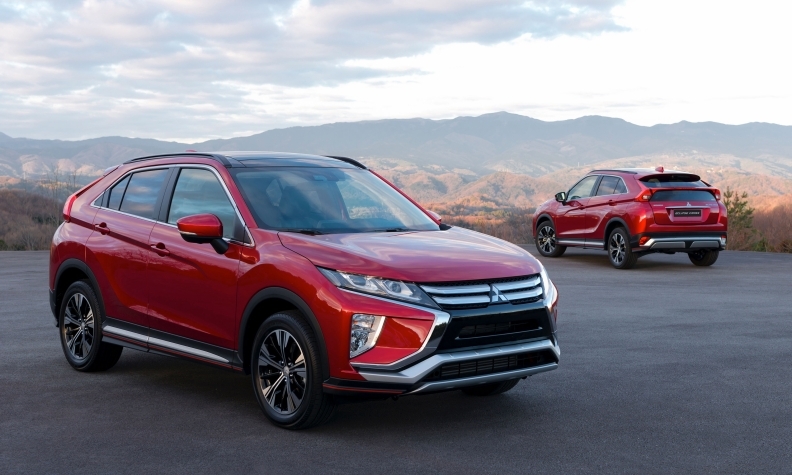 The Eclipse Cross is just the beginning of Mitsubishi’s forthcoming product revival that will focus on crossovers. A redesigned Outlander Sport is expected next and will shrink to avoid the current overlap with the Eclipse Cross in market positioning. The next-generation Outlander will grow larger and slightly upmarket when it debuts in 2019. Plug-in hybrid variants are expected in at least one of the models going forward.